It doesn’t matter what camera you have right now, you need to constantly self-improve as a photographer. 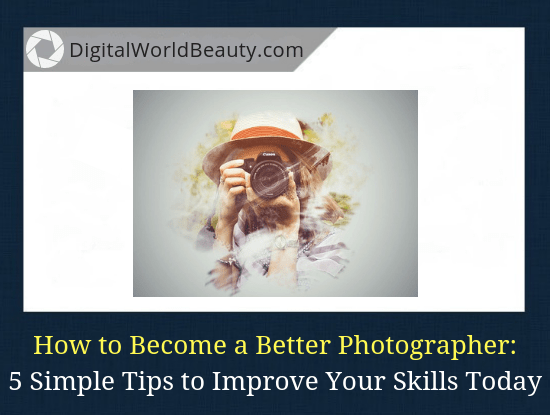 Today’s topic will be on how to improve your photography skills, especially if you are a beginner. The 5 tips are simple, yet effective. Practice: Take Photos, Take More Photos, And Even More Photos! Photography School – Is It Worth It? If you only take photos in the “Auto” mode, then you simply have to read the manual that comes with the camera. If the manual wasn’t included in the package, find the manufacturer’s website and read the info online. Camera user manual is usually a pretty thick mini-book, which not only describes in detail all the functions of the camera, but also gives you practical advice on photography. And don’t worry if you don’t understand everything you read. Over time, you can supplement the knowledge from other sources. Your camera instructions manual is a source where you can get basic information on photography. On the Internet, you can find a lot of forums/group that you can join and participate in. For example, you can join Reddit and search for photography-related subreddits (subgroups). Alternatively, you can search Facebook photography groups, where you can gain new knowledge and connect with fellow photographers. What exactly do you gain from being a part of the online forum? 1) You will find there a lot of thematic branches. For example, a topic dedicated to Nikon D7100, D600, etc. In these topic sections you can easily ask questions to the owners of the respective cameras, share some of your thoughts or your photos. 2) You can ask a question, for example, about a specialized camera and lens choices for sports. 3) You can read reviews on virtually any camera or lens in the corresponding section of the forum. For example, there could be a section titled as “discussion of photography gear”. 4) And, of course, you will be able to see images shared by other users, and something to learn from those who have surpassed you in terms of photography skills. However, you should understand that regular people like you are registered on the forum and therefore they are subjective in their judgments. My third advice is to visit websites with the best modern photos, learn from professionals. There aren’t too many sites, where you can really find high-quality work of modern photographers, but they exist. Flickr is one of the most popular international sites, where any user has the ability to store a huge number of their photos. You can add descriptions and tags to your photos so that other users can find them. Search is one of the main advantages of this resource. You can search for photos by type of photo gear, by shooting parameters, by genre. At the same time there are no complex filters, you simply type in the search what you are interested in finding. 500px is also an international site. Similar to Flickr but more socially oriented. What I’m trying to say is that it’s more of a social network devoted to photos, where you can create your portfolio, “like” the work you like, and on top of that you can join to make money online with photography. Unsplash is a community of talented photographers. It is a great photography-related website that will make you realize there is plenty of room to grow for you as a photographer. The photos are seriously AH!-mazing. You will definitely feel inspired going through Unsplash photos. Of course, there are a lot more photo-websites on the Internet, but these 3 are the ones I enjoy the most. Famous photographers often write very useful books. Find a good photography for beginners book that you can learn from. There are a lot of useful books from professional photographer, Michael Freeman, that are advised to read for everyone addicted to photography. His books allow you to get acquainted with the main photography-related questions. A great starting place that has the best all-around introduction to photography for any camera. Intuitive descriptions of aperture, shutter speed, ISO, and focal length, and how to make them work for you. If you want to learn how to capture people’s attention, read Valenzuela’s book. Some people say it’s been the best advice for them. Roberto is a wedding photographer, but his techniques apply to all photography genres. I also have a separate article on more good books for beginners to learn about photography. In terms of master classes, these are paid events, in which professionals show and tell you what they think you should know. Or you can register at some good digital photography for beginners course. Learning is good but action is better. Once you learned something from the master class you attended (or books you’ve read), go out and apply your newly-gained knowledge in practice. This way, through the books and the courses created for beginners, you will improve your photography skills. Tip #5. Practice: Take Photos. Take More Photos. Take Even More Photos! When you understand the camera instructions and understand DSLR camera shooting modes, you will need practice. Lots of practice to learn to take really good photos. Professional photographers often talk about a number of 500,000 photographs. That’s a lot (and it’s good). On average, experienced pros take about 20-30K photos a year. Of course, the 500k number is relative, but you can absolutely use it as your approximate point. When reading books and attending master classes, don’t forget that the most important thing is practice! Is It Really Worth Going to A Photography School? Photography school is the last point that I wanted to talk about today. Let’s take a closer look at this question. What Are the Real Advantages of Photography? In school, you will be taught about what you really need to know about the shooting process, camera modes and other basic aspects. Ideally, the teachers will teach you quickly and without superfluous deviations. But the main advantage is practical training. I mean, there HAS to be hands-on experience at a photo-school, that’s for sure. Don’t go to one where you are only taught a theory, but apply your knowledge in practice only at home, and then show the result to your teacher and being “evaluated” in such manner. 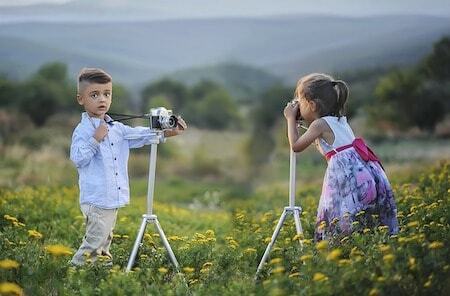 Usually the price that you pay for photography lessons is pretty high. In the end, if you find one of the best photography courses with a lot of practical exercises, led by great, experienced photographers, then you can sign up. (Provided that you are ready to spend your money and time for it). If you do not want to spend money, then read the points above. Their implementation may be enough to improve your photo skills and make you understand how to be a better in what you do. Improving As A Photographer: Your Thoughts? What are YOUR ways to improve photography skills for beginners and become a better photographer? Any questions, suggestions, or recommendations? Excellent article. I have been using a waterproof action camera to get underwater shots while on vacation. The camera I’m using does an ok job but I want better. Are there any underwater cameras you would recommend? If so, what would your top five cameras be? Thank you for the tips! I did mention a few waterproof cameras in the best camera for vacation post, GoPro Hero 6 being one of them. If you are looking for a camera than even the kids can use, then I recommend getting a Nikon Coolpix W100. Fujifilm FinePix XP120 is another good camera for vacations since it’s shockproof and waterproof. Further details are in this article which includes a few great underwater cameras for vacation/trip purposes. I have always enjoyed taking pictures my whole life and believe pictures are important in life. They are a snapshot of time or memories in life, which are important to have. At the young age of 50, I am planning on teaching myself about taking better pictures so your article was a great find for me. You explained everything great, I was thinking about going to a photography class and still might. But it’s good to know that you really don’t have to. I will be bookmarking your website so I can keep checking back on your articles. Thanks for the awesome information and I look forward to learning how to take amazing pictures from your website. It doesn’t matter how old you are, it’s never too late to learn something new! Myself being in the online business industry, I am constantly learning something new (literally every day). It helps to grow and become better at something. Now in terms of photography, I do suggest you take some photography classes because in schools they will be able to give practical classes and show you in person how it all works. And if you still don’t have a digital/DSLR camera, then consider taking a look at these 10 top-rated entry-level digital cameras for beginners (updated for 2018). Good luck to you and happy shooting!